TV’s hippest kid’s show is coming to The Fabulous Fox Theatre in Atlanta, GA next Wednesday, Dec. 3 at 6:30pm! This new live stage show marks the 5th anniversary of the live tour. Yo Gabba Gabba! 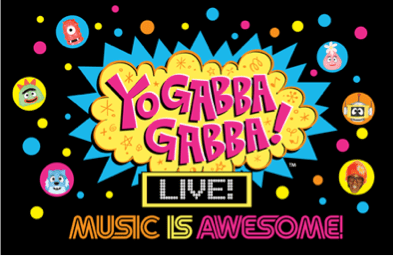 is an award-winning, live-action television series and live stage show that revolves around the adventures of DJ Lance Rock and five colorful characters who come to life when they hear the magic words, “Yo Gabba Gabba!” The series launched in 2007 and its unconventional formula has since created a quadruple-stacked fan base, making it a popular entertainment property among preschoolers, their parents, indie-music lovers and celebrities alike. The colorful cast of Yo Gabba Gabba! will be joined by DJ Lance Rock, fan favorite Leslie Hall and the ultimate beat-boxing legend Biz Markie for this special tour. The state-of-the-art live show production features music, singing, dancing and animation. Special guests are invited to join the party on stage in each city for the “Dancey Dance” and “Super Music Friends Show” segments. All new performances of show favorites including the veggie friendly “Party in My Tummy,” along with collaborations and medleys that will instantly remind us to jump and dance. The Gabba gang will also participate in various service projects in the cities they visit during their 55-day journey with REVERB, the non-profit environmental organization dedicated to educating and engaging musicians and their fans to take action toward a more sustainable future. $1 from every ticket sold goes to support environmental efforts and education. Tickets are $23.50 – $46. Show is at 6:30pm. Black Friday Special! Buy a TA Gift Certificate & Get an iTunes Gift Card!